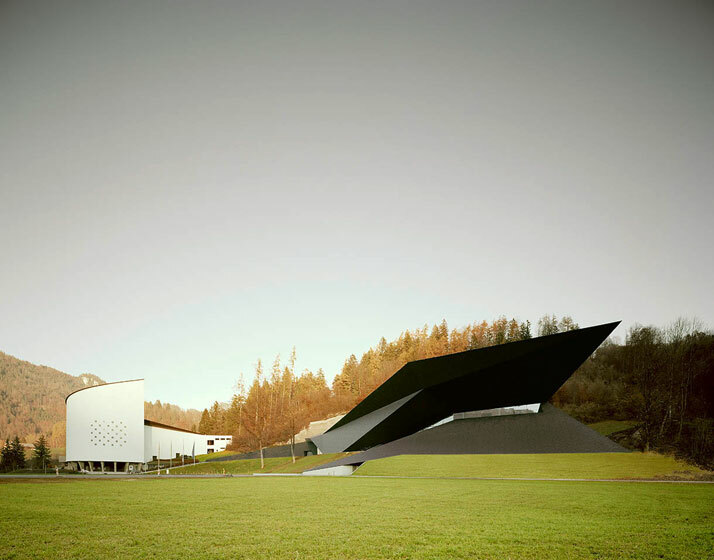 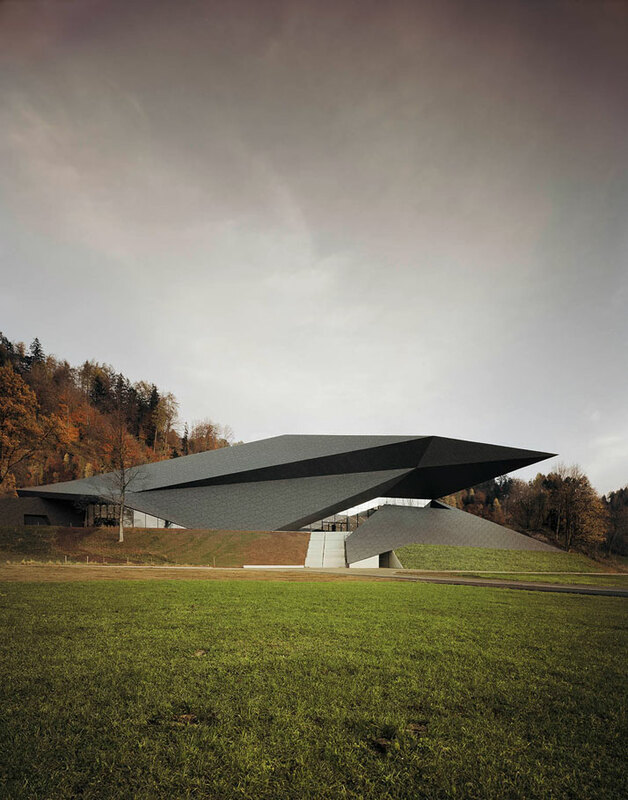 Positioned against a background of rock formations, the new stunning angular black Festival Hall at the Tiroler Festspiele Erl (Mühlgraben 56 A 6343 Erl, Tyrol, Austria) by Austrian architectural firm Delugan Meissl Associated Architects undoubtedly derives its form from the site's surrounding topography. 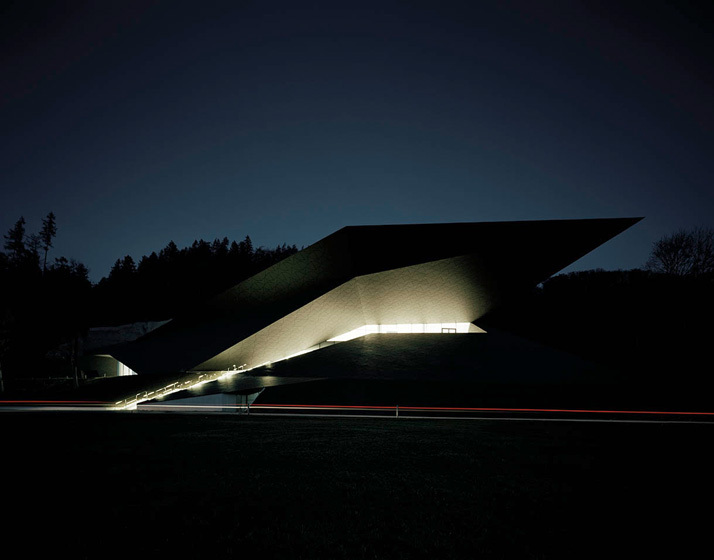 The existing Passionsspielhaus or ''Passion Playhouse'', originally constructed in the 1950s, has operated extensively since 1998 as a summer opera and orchestra venue hosting a large part of the Tyrol Festiva. 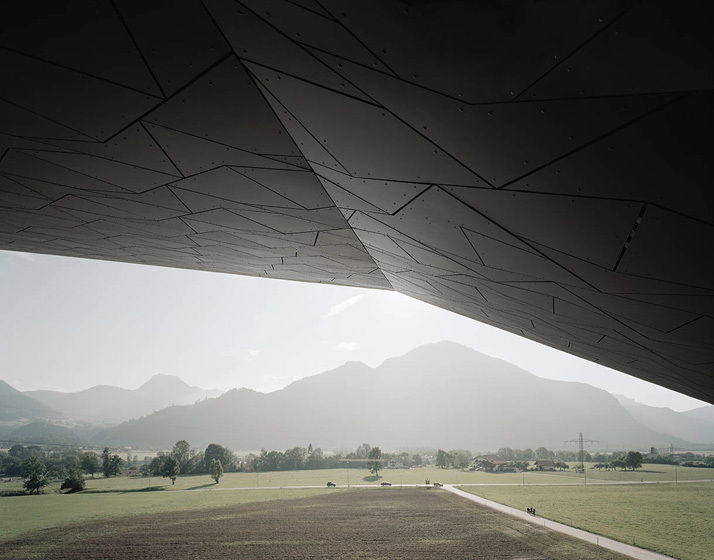 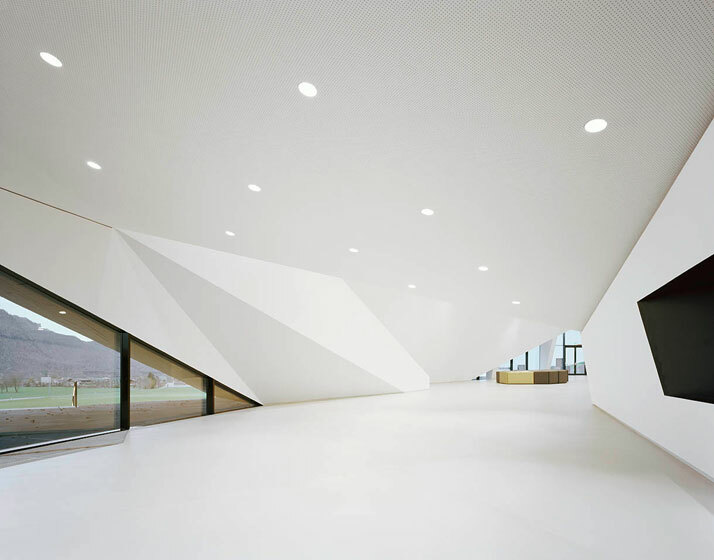 Delugan Meissl Associated Architects were called upon to design a new festival hall for the winter months and their new single monolithic volume design virtually pierces into the existing structure. 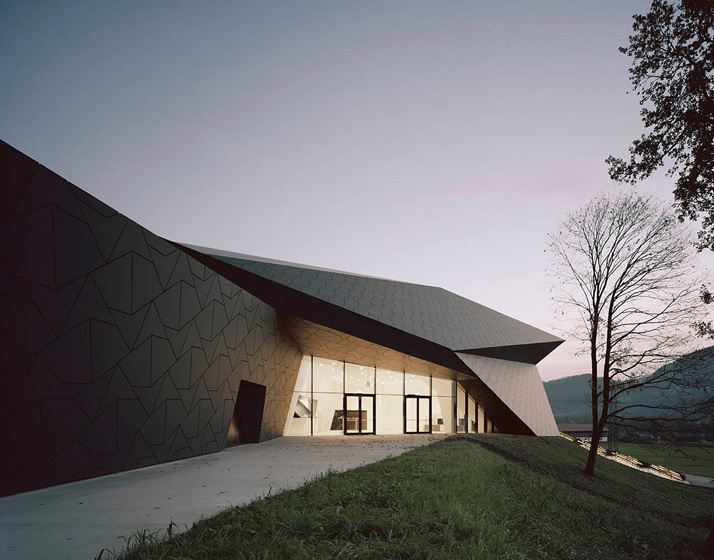 As the one is oriented towards the other, both structures complement and elevate their respective architectural dialogue through their dramatic visual interaction with one another. 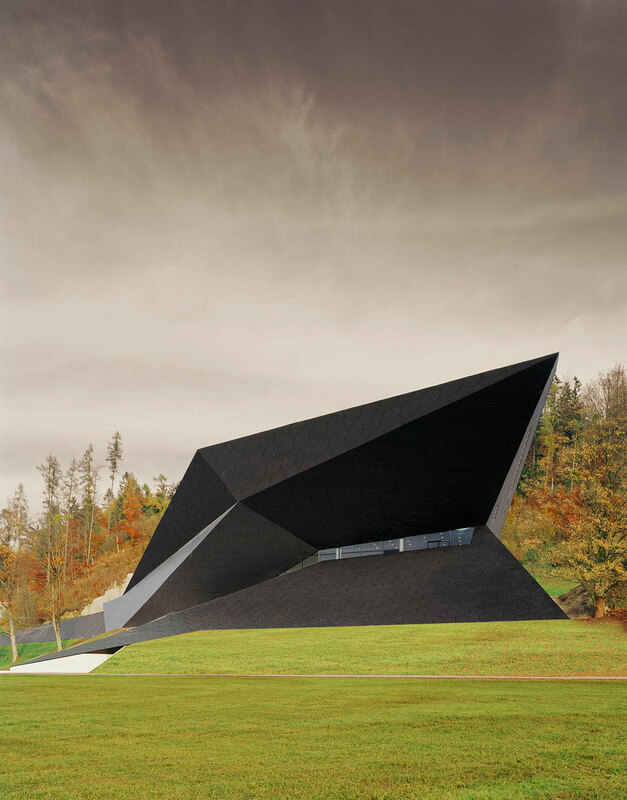 The new faceted black structure which was completed in August 2012 accentuates both the natural and architectural environment through the duality in the contrasting geometry and color augments in the two. 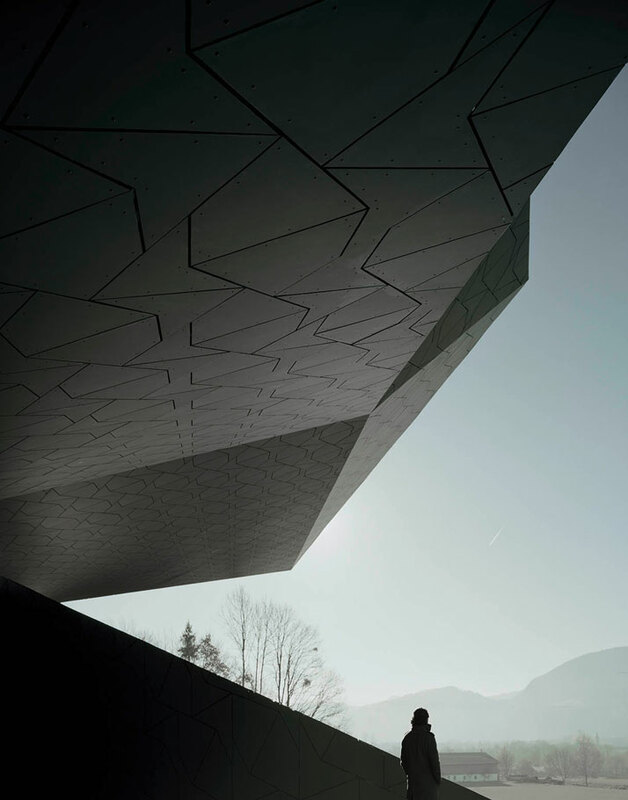 While the white surface of the Passionsspielhaus stands out optically during the light summer months of the festival, the changing of seasons brings about an achromatic reversal of the ensemble where the new winter structure comes to the fore. 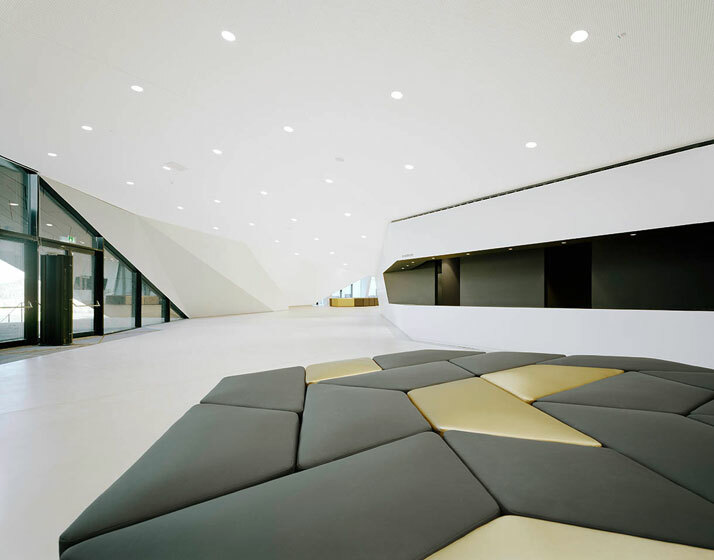 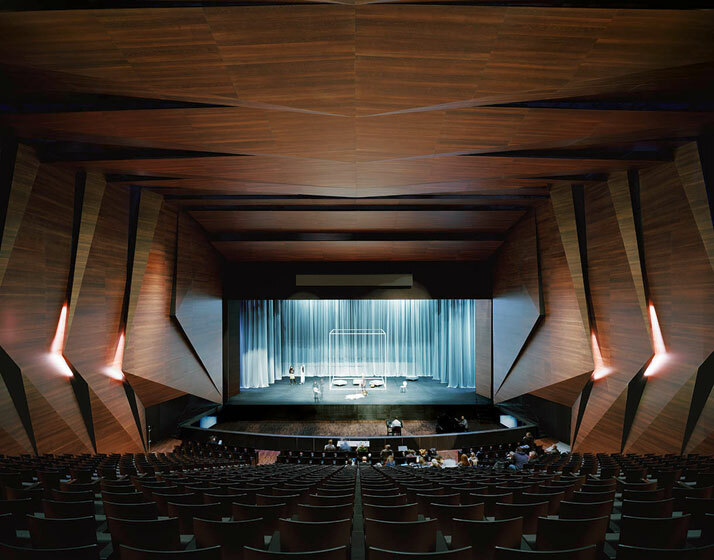 The topographic imprint of the new building is continued throughout its interior directed by two dominant parameters; the interrelation between the interior and the surrounding natural space as well as the spatial configuration of a functional, internationally acclaimed concert hall. 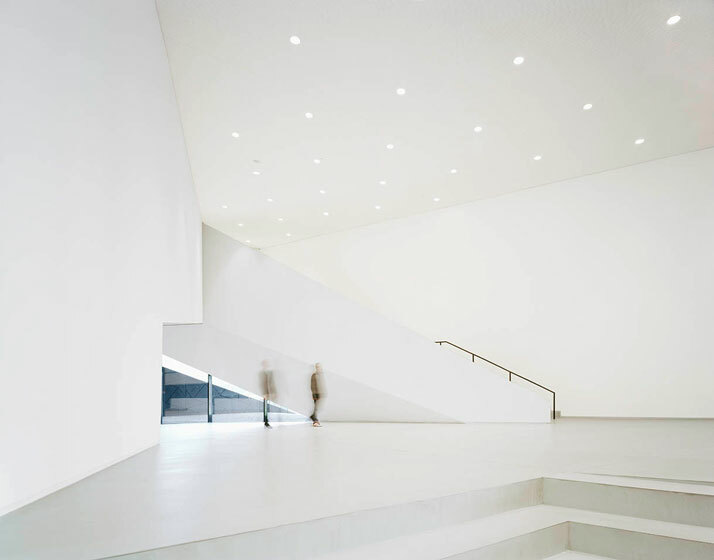 A recessed staircase transitions into an asymmetric construction in the strikingly clean-white grand foyer which leads into a geometrically timber-lined auditorium (there are two other entrances on the upper level). 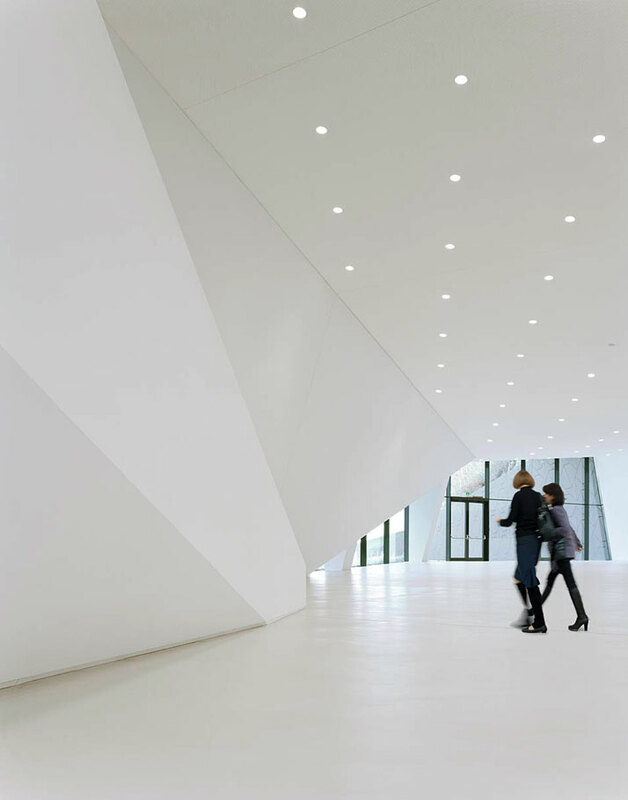 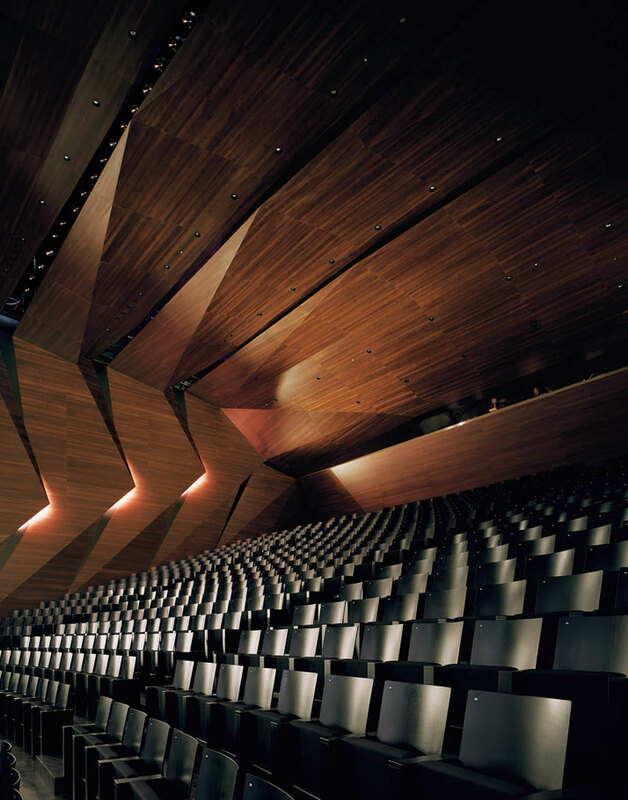 The transition from the foyer into the auditorium with its soaring spatial elements exerts a plethora of sentiments on visitors where dynamism, variability and asymmetry give way to maximum concentration, static calm and orthogonality, as the architects themselves point out. 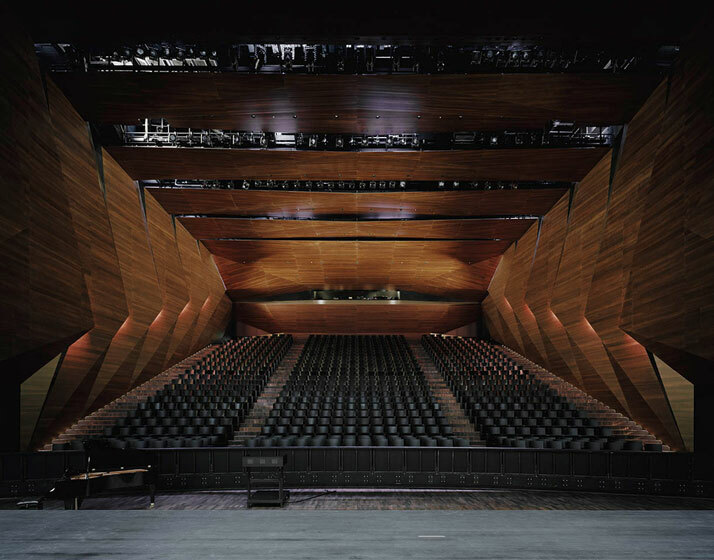 All in all, the general spatial layout and corridors throughout the new festival hall act as immense communication zones where flowing visual and functional spatial references define the architecture making for a building with an orthologic, yet captivating and coherent architectural layout.